France is a great place to find exciting new adventures on holiday. The stunning scenery from mountains to coast, forests and waterways is the perfect setting for adrenalin fuelled fun! Here are five ideas for holidays on the wild side of France! Did you know that the Pyrenees mountain range is home to wild Brown Bears? They are hard to find but you might see footprints and signs of their activity if you know where to look! Deer, raptors and mountain goats are all easier to see as you explore the stunning peaks, valleys and hidden lakes in the mountain landscape. Choose from guided hikes, mountain bike trails, horse-riding, climbing or even skiing and snow-shoe trekking in the winter months. Exhilarating views, challenging terrain and a chance to see vultures, eagles, deer and even bears in their natural habitat – the perfect mountain adventure! Adventure Creators are a great company specialising in Pyrenees adventure holidays – spend 3 days to a week on your mountain adventures and then rent one of our lovely Pyrenees self-catering properties with a pool to enjoy the region at a more relaxed pace! Forest adventure parks are very popular in France and Indian Forest Vendee is one of the biggest and best! Choose from 17 different courses offering the right challenge for all ages and abilities and test your agility with tree climbing, parkour and zip line rides through the trees. There is also exciting water slides that launch you into the air before you splash into the lake, paintball, zorbing and bungee jumps – it’s a full day of adventure that’s especially fun for families with older children. If you are staying nearby you may want to buy multi-day tickets or save on combined tickets for Indian Forest and the nearby O’Glisspark water park. Surfs up on the Brittany coast! Northern Brittany has a fabulous coastline for all kinds of watersports and sailing. Dossen beach is a great example; a long sandy beach exposed to plenty of wind it’s the perfect place to surf, windsurf and kitesurf in the waves. This beach is also a hotspot for sand yachting or land boarding with the flat sands and westerly winds making ideal conditions for the sport. Dossen beach often plays host to international watersports events so, as well as having a go yourself, you may get to see some world-class surfers and windsurfers in action! Normandy is a great choice for airborne extreme sports; the landscape here is filled with historic sites including the war cemeteries, memorials and famous sites from WW2. The view from above of these, as well as the glorious Normandy countryside dotted with villages, towns, farms and chateaux is a wonderful sight from the sky. Adventurous travellers can choose a flight in a microlight, or try paragliding or skydiving from the Aerodrome in Lessay, while those who prefer a passenger seat can take an exciting helicopter or light aircraft tour with Golf Tango based in Le Havre, or plan a magical hot air balloon ride with Montgolfieres de Falaise. Acknowledged as the most beautiful gorge in Europe this wooded canyon filled with stunning blue-green waters is ideal for adventurous travellers. Hiking is very popular here with guided expeditions revealing the best of the incredible scenery. You can even hike at night by the light of the full moon for a totally unique experience! On the water you can canoe or kayak discovering hidden caves, dams and nature, or paddle at sunset for magical views over the water. A bird’s eye view of this amazing landscape is a real treat so why not take a hot air balloon, microlight or glider flight over the area? 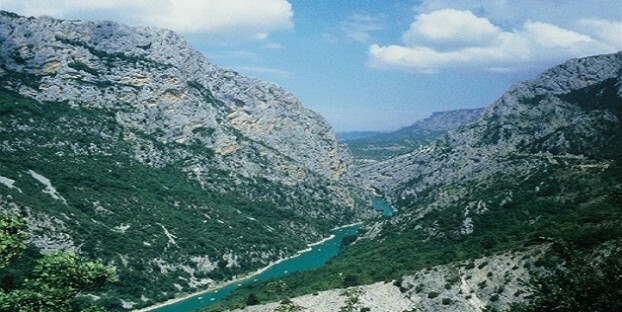 However you choose to explore Gorges du Verdon make sure you bring your camera – the scenery is sensational!